As the final month of 1976 rolled around, Elvis arrived in Las Vegas for what would be his 15th and final visit as a performer, playing 15 concerts to some very mixed press reviews. By all accounts, health and weight issues had unfortunately contributed to a lowering of the very high standards Elvis had once embraced as a live artist. Still, the fans always came, and sometimes Presley showed more than a hint of the magic that made him the greatest singer of all. 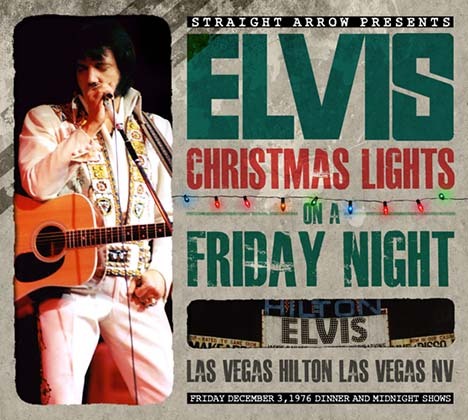 On this collection are the second and third appearances of the ten-day stand, and Elvis is in quite good form, including seasonal favorite "Blue Christmas" along with favorites like "Tryin' To Get To You", "Bridge Over Troubled Water", "America the Beautiful" and the powerhouse gospel of "How Great Thou Art". As always, his rendition of "Hurt" is thrills both audiences. It was a Friday night to for any fan to savor throughout the holiday season. As fans have come to expect, the recordings are of very good audio quality, sourced from original master tapes recorded by British super-fan "Gemini.” The double digipak is filled with liner notes and photos from both shows that December 3rd. Again, these recordings have been carefully engineered to be presented in the best possible sound.